This gathering marks the final celebration in a weeklong festival of neighborhood walks and other activities including a forum on urban design, a popup parklet on North Main Street with a birthday cake for Jane, a film screening on the demolition of the Laurel-Clayton neighborhood and rise of Plumley Village in the 1960s. The week was filled with walking conversations, explorations of neighborhoods and different ideas about how we design our streets, buildings and blocks. It was absolutely exhilarating and community building and enlightening!! I learned little facts I never knew before: Who knew that those griffins gracing East Side Park once marked the spot of an old Union Station that had long been demolished? I for one am even more in love with Worcester than I was last week! There were so many incredible experiences: popping up a mini parklet that took over two parking spaces in front of Deadhorse Hill; and having Nancy McBride, Jane’s niece, tell her own Jane stories before she cut the cake; Isaiah Thomas reading the Declaration of Independence in front of City Hall on a rainy Friday; learning about the speakeasies on Shrewsbury Street; seeing bike paths and new housing sprouting up in Main South; and getting a chance to see the condo units at Shaarai Torah when several owners opened them up for us. The hard workers on the Jane Week planning committee: Paul Dell’Aquila, Susan Ceccaci, Kyla Pacheco and Deborah Packard. Our sponsors: Greater Worcester Community Foundation and Home Depot. Polar Beverages and Table Talk Pies donated their wares. Thank you to our partner organizations: Preservation Worcester, Walk Bike Worcester, Action! Worcester, Worcester Tree Initiative, Worcester Historical Museum, Worcester Sun, Massachusetts Smart Growth Alliance and Mass Audubon. Cities are diverse, social, economically thriving when they have mixed uses, old buildings mingling among the new, small blocks where you can encounter the unexpected and lots of density. 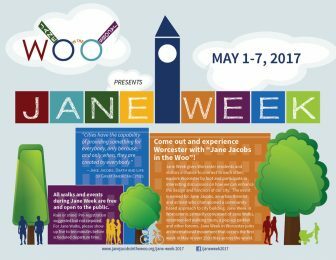 “What would Worcester appear like to Jane Jacobs and how would she advise us?” This was the driving question when I started the website, Jane Jacobs in the Woo a year ago. What would she say if her ghost arrived today on a train at Union Station? In honor of her 100th birthday, I committed to blogging for a year to stimulate conversations and actions on how we can continue to build a vibrant Worcester. I believe that Jane Jacobs would decry that since the 1950s, Worcester has primarily chosen the Robert Moses path leading to the suburbanization of our city. Our city was cut in two with the laying down of [Interstate] 290. So many of our key development projects, from the Salem Square urban renewal initiative all the way through to the ice hockey rink this year have followed the model of park-enter-leave, large-scale development projects taking up huge swaths of land. These projects wind up killing off the street life of a neighborhood. Jane Jacobs offered us a different paradigm of development that is incremental, organic, holistic, small scale, and based on the talents and energy of locals. Some of the best examples of a taste of Jane are right here in the Canal District and in what I saw in full action on a [Jane Week] tour of Main South. Worcester is on the cusp of a true renaissance! Can’t you feel it in the air? I can feel it when I visit the Technocopia makerspace or tour the art murals that POW!WOW! Worcester popped up last summer or when I come on down to the Canal District. Where do we go from here? How can we take it to the tipping point to make this a full-scale revival? How can we capitalize on our scrappy, gritty, immigrant-filled, working-class roots to grow this city into the gem we always knew it could be? I found some clues in some of the casual conversations I had on walking tours that week. I met Heather on the Main South tour. She had been a graduate student at Clark [University] and decided to stay because she loves it here. She got rid of her car and can get back and forth to work downtown by walking or riding a bike. Rents are affordable. She has found what she wants to settle in a place. She grew up in Brooklyn. In her mind, “Worcester is the Brooklyn I grew up in.” She wants to stay here! There is a high demand for dense, mixed-use neighborhoods where you can ditch the car, neighborhoods that are alive, fun, safe, community-filled spaces. We need a plan, a vision, a dream of where we want to be in five, 10 and 20 years. Each year, I do my own personal vision board. I dream my year, see it, cut out photos from magazines and place them on cardboard. I see it, name it, put it down on paper so that the dream can then materialize. As a collective, we as members of the city need a collective vision board. We need to highlight the importance of building walkable, amenity-filled neighborhoods that link to each other. Walkability is in! Demand for these types of neighborhoods and cities vastly outscores supply. We need to build walkability into our street design. 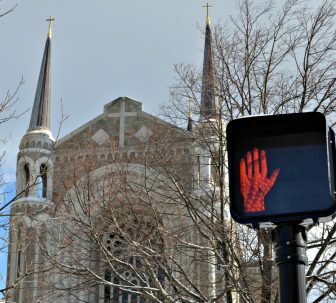 Worcester, it is time we adopt a Complete Street policy as so many cities and towns statewide have already done. We want streets for people and bicycles not just for cars so there is equitable street access for walkers, cyclists and car drivers. We need expanded modes of civic participation in our development process. At the film screening, discussion evolved – people don’t know how they can get their voice heard in the civic sphere. Do their ideas make a difference or do projects just happen with little community oversight? One barometer of the lack of efficacy that locals feel in shaping the urban landscape is the low voter turnout in local elections. Increased opportunities for the public to participate in planning processes could be as simple as posting information electronically on projects before such committees as the planning board or historical commission meet. People want to be involved in development decisions. … We have to increase the mechanisms to make that happen. Last October 2016, the national 20,000-member organization Strong Towns put out a call for nominations for the strongest infrastructure project. Jane Jacobs in the Woo wrote a comprehensive proposal nominating Crompton Place for the honor. More than 200 cities and towns across the United States and Canada nominated worthwhile projects. Crompton Place was selected for the final top five. The final open voting placed Crompton Place No. 2 nationwide as the strongest infrastructure project. This jewel of a project recognized on the national level deserves to be recognized at home. Small-scale development: Many larger development projects are infused with public monies. Crompton Place celebrates the efforts of those hardy souls, the small-scale developers who rely on their own grit and most of their own financial reserves to make it happen. Incremental pace of development: I first met Dino Larusso last year when he was personally laying the bricks for the patio out back. It reminded me of the work that Jane and Bob Jacobs put into their brownstone on Hudson Street [in New York]. … Little by little. Brick by brick. Compare that to the large mega-projects characterized by the mighty work of many bulldozers. Celebration and promotion of small, locally owned businesses: Let’s give a shout out to the tenants here: Crompton Collective, which showcases the wares of local antique and craft vendors; Seed to Stem, BirchTree Bread Co., hub of a meeting spot for so many of us and a place to eat fine breads, listen to local musicians, see local art displayed; the barbershop, home-ownership center, and a space where local farmers can peddle their freshly grown produce at the weekly farmers market. Importance of locally owned: Dino and Robin are not outside developers with few ties to the city. They were born and raised here, and they actually live on site. It doesn’t get more locally owned than that! Project integration and enhancer of “walkability” within the Canal District neighborhood: Crompton is the neighborhood hotspot hosting weekly Canal District Farmers Markets, free summer Thursday evening outdoor music concerts and free horse and wagon tours led by local high school students trained to narrate the history of the neighborhood and the Blackstone Canal. This project does not function on its own but is a part of the intricate web of neighborhood life within the Canal District. When I was dropping off the Polar seltzer water and Table Talk pies, Dino and I got into a conversation about parking. Although another development project is online for the far end of the property, he was not worried about parking at all. There will still be parking on site plus there is also street parking. “Ideally, great neighborhoods don’t have tons of parking,” he said. In this core of the Canal District, there should be parking on the outskirts so people can walk around more within the neighborhood. I got a big smile on my face. 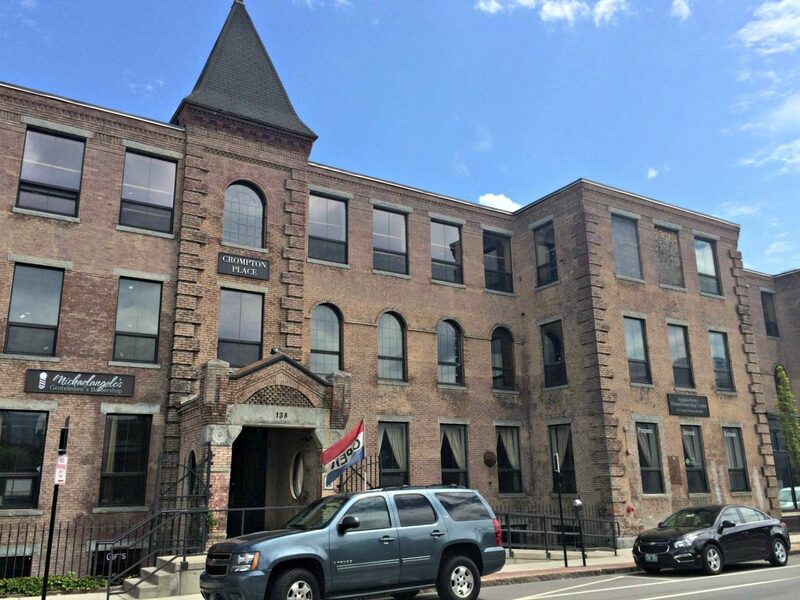 Jane Jacobs In The Woo was pleased to present the 2017 Jane Award to Crompton Place as a shining example in our city of a development project that spearheads the revitalization of the city of Worcester, a project that results in the peopling of the streets and the locus of community activity. Joyce Mandell has worn many hats – mom, community organizer, sociologist, community development specialist, urban studies professor. She has lived in Worcester more than 20 years and first moved to the East Side when she served as the economic development director of Oak Hill Community Development Corporation. She believes in the potential of Worcester, the power of praxis and the truth to be found both in stories and stillness. Thank you Joyce for creating this important conversation and informing us about Jane Jacobs planning and design ideas. In the Canal District we have learned that there is an almost insatiable appetite for all things Worcester. We love our city and know how to regrow it.